It’s easy to get a bad case of "the cooking blues" when you’re preparing a delicious meal and suddenly realize you don’t have a key ingredient. For example this past week I was halfway through preparing a jerk chicken marinade and discovered I didn’t have molasses. It was definitely one of those bummer moments. Like when you hear your favorite band is going on tour but later realize they won’t be coming to your city or town…that’s how you get the "concert blues". After a bit of mild cursing I started to think about what I was going to do with my partially finished marinade. I really didn’t feel like making a special trip to the grocery store and I wasn’t about to throw away what I had already prepared. Then I remembered my handy kitchen helper guide that hangs on my fridge. It contains a number of emergency food substitutions and luckily it included one for molasses. It suggested I use honey but I added some brown sugar as well and the marinade ended up being almost as good as the molasses version. Here are a few other substitutions I’ve used from my kitchen helper guide and some tribute bands you can check out if a big musical act skips your town. Food substitutions and tribute bands are never as good as the real thing but they can help you beat the cooking and concert blues. The Scenario - You’re whipping up the sauce for honey garlic chicken and discover you don’t have the required 1 cup honey. Substitution - Combine 1¼ cups sugar plus ¼ cup water or apple juice. The Scenario – Alanis Morrisette’s tour bus blows a tire and the concert gets canceled. Substitution – Go see the Alanis MoreOrLess show when her mini van pulls into town. The Scenario – You require a cup of buttermilk for pancakes but you don’t have any on hand. Substitution - Mix together 1 tbsp of lemon juice or white vinegar plus enough milk to make 1 cup. The Scenario – You’re waiting for Led Zeppelin to do a reunion tour. Substitution – While you waiting for that miracle to happen, you can “get the led out” at a Les Zeppelin show. The Scenario – You’re making your famous lasagna and realize you don’t have 2 cups tomato sauce. Substitution - Mix together ¾ cup tomato paste plus 1 cup water. The Scenario – You find out Shania Twain is busy finding a new hubby and won’t be on tour for a number of years. Substitution - Check your local concert listings to see when Shania Twin will be in town. 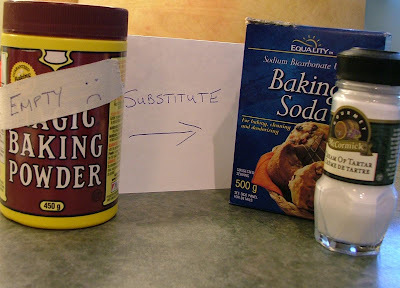 The Scenario – You get up early in the morning to make muffins and find the baking soda jar empty. Substitution - For 1 tsp baking powder use ¼ tsp baking soda plus ½ tsp cream of tartar. The Scenario – You love The Kinks and The Pretenders but you not sure if they still tour. Substitution – The Kounterfeit Kinks and Pretend Pretenders are still on the road so catch one of their shows.